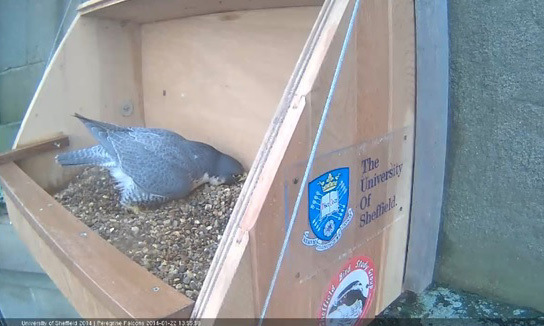 There is much to celebrate as we move into 2014: a new, stronger nest platform with improved design is in place, a second webcam is on the cards to provide a panoramic view of the site, and the birds are back despite the cranes and considerable construction activity on the adjacent Jessop East site. 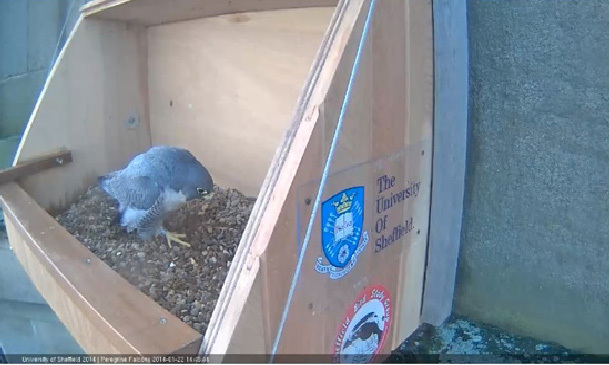 It is sad to report that the young male that was taken into care back in the summer was found dead to the east of Sheffield earlier in the winter, apparently of natural causes. Mortality rates in young Peregrines are high, with somewhere between 50% and 70% of birds failing to make it through their first year. About half of those that die in their first year are thought to succumb to disease or parasitism, and it may well be that the young male suffered from this from an early age, perhaps accounting for his grounding in July, when no injuries were apparent. 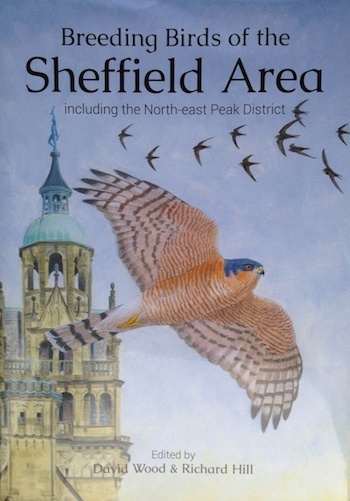 Given the many challenges facing the species, we are determined to continue to support the recolonisation of the Sheffield area, although the move of birds into urban settings is a relatively recent phenomenon. 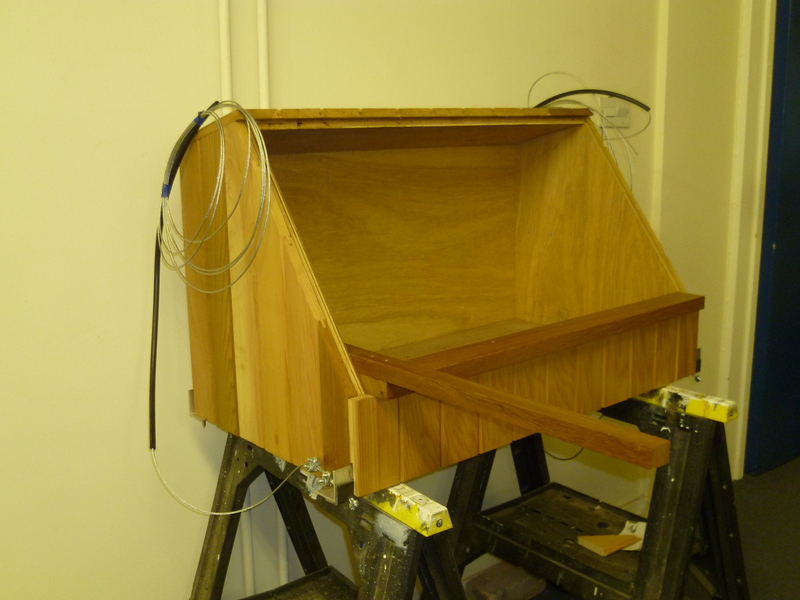 The team that built the original platform that proved so successful over the last couple of years tweaked the design to make it even better and had it ready to be put in place by the end of November. Jim Lonsdale gave me a call to come and see it for myself. Great work by Jim and the small works team in the Department of Estates! 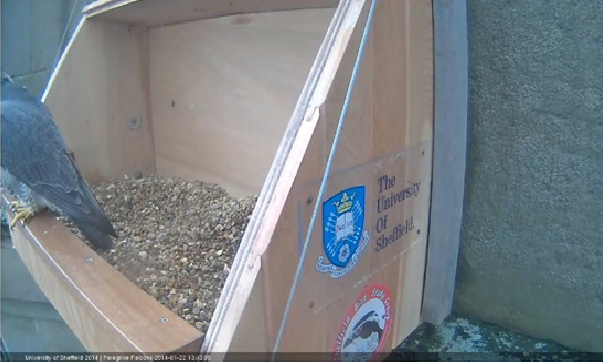 The main changes are in the quality of the materials, which are built to last (the previous platform was to test whether or not the site would prove attractive), and a notably deeper lip at the front edge to reduce the risk of young birds dropping out. It’s a very substantial piece of work that should last a decade or more. 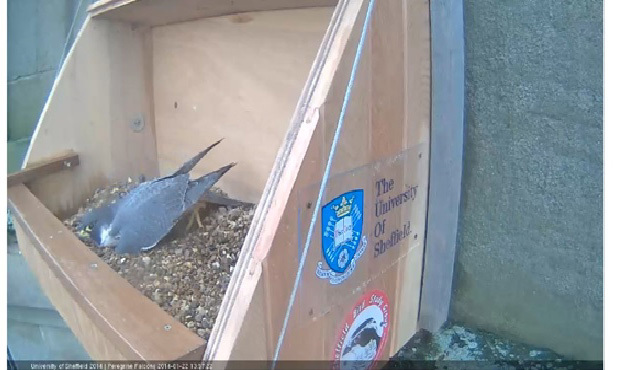 On 22 January a flurry of activity over lunchtime saw first the female and then the male on the platform in quick succession, with both busily scraping the gravel. To watch something like this is a rare privilege: the technique is to huddle down and scrape the gravel back with the talons, creating a hollow under the body. The female also spent some time picking individual pieces of gravel and placing them in just the right spot. Both birds look to be the adults that have bred successfully for the last two years, the male’s ring just about visible on its left leg in the image below. The quality of this screen grab isn’t up to much, but if anyone manages to read the lettering on the ring we’ll be able to discover his origins. Reports of three birds over Norwood allotments, including two birds talon grappling, sounds like territorial behaviour and a possible attempt to establish a new pair around Sheffield. Definitely one to watch! 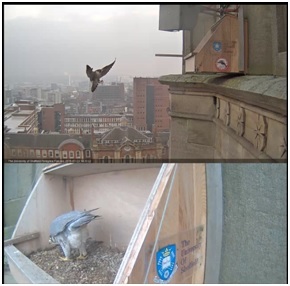 The webcam will be viewable via http://efm.dept.shef.ac.uk/peregrine/ and a second, with a view across the ledge to the platform, should soon be up and running too. Much to look forward to in the weeks ahead. Fingers firmly crossed for another season of breeding success. And the Resolution? To try to keep regular updates on the blog through the breeding season. Easier said than done, but isn’t that what resolutions are all about? !